There are around 180 little tomato plants under there! 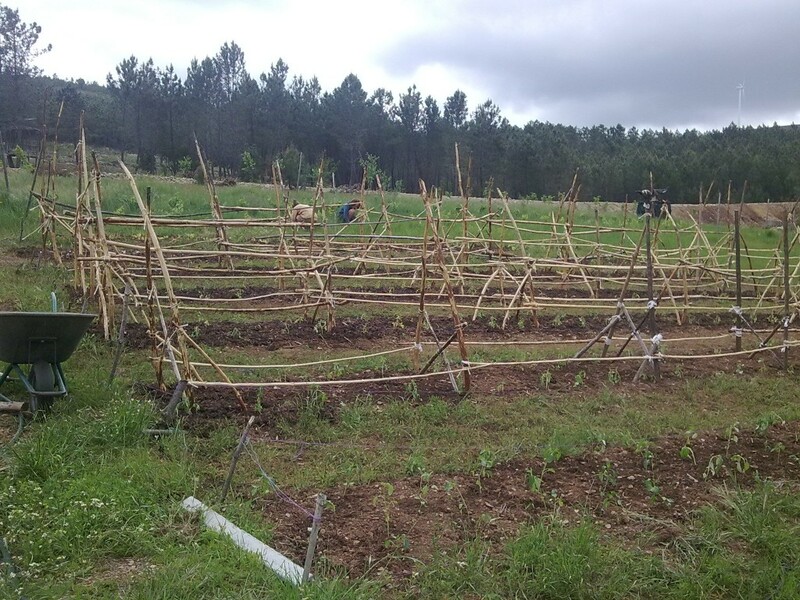 In front are 200 + peppers, which grow amazingly well here, and behind are aubergines. We calculated the number of plants to each row but ended up with far more than planned so were scrabbling around extending beds and sticking them anywhere that was bare. Unfortunately it means we’ve filled all the space planned for chillies already. The tomato supports are a huge amount of work as each piece of wood (pine saplings cut from the forest) has been debarked. Debarking removes the habitat for most of the little beasts which enjoy eating dead wood, so it means they’ll last longer. At the end of the season the tomato support will be dismantled and the stakes will be reused as vine supports. We’ve tried various different approaches with our tomatoes, from high maintenance pinching out buds and tying them in to allowing them to sprawl completely untended. We got a hell of a lot of tomatoes when we allowed them to sprawl, but many of them rotted before we got to them as they were hard to access, So, back to higher maintenance this year. I’m trying an experiment this year of using butternut squash as a planting under the vines. At Ragmans Lane Farm they used pumpkins under apple trees but I think the pumpkins are a little too vigorous for the vines which are still young, hence the choice of smaller squashes. Plus, I adore butternut squash! They’re my favourite veg of all I think, but in the unlikely event that I don’t manage to eat them all single handedly, the animals are also fond of them. 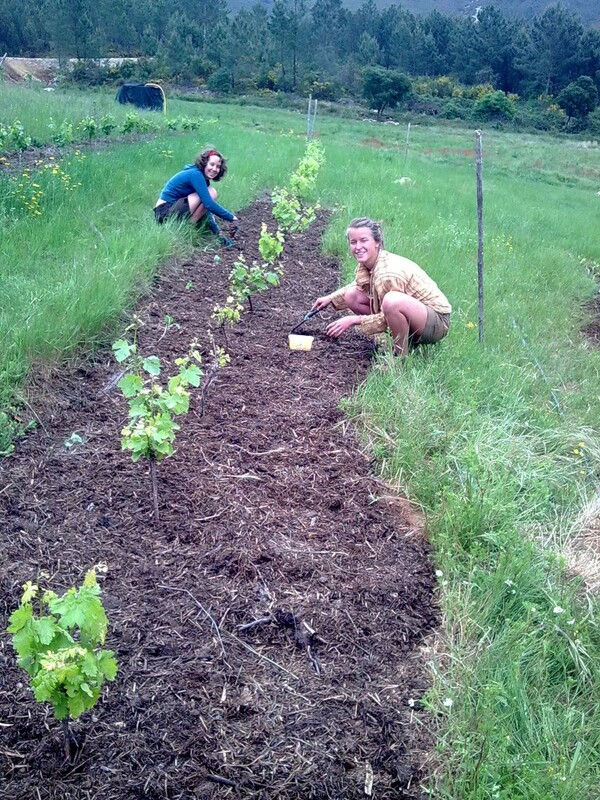 Here’s Helene and Kate seeding them, though we’re only managed about a sixth of the beds so far. There’s a bit of a wonky edge going on there that I had better add to my to-do list! We’ve brought in four pick up loads of goat manure so far from a neighbour in Unhais o Velho. Ours just don’t produce sufficient for our needs! Much of the planting we’re doing this year is on soil which we’ve not cultivated previously and it’s seriously lacking organic material. 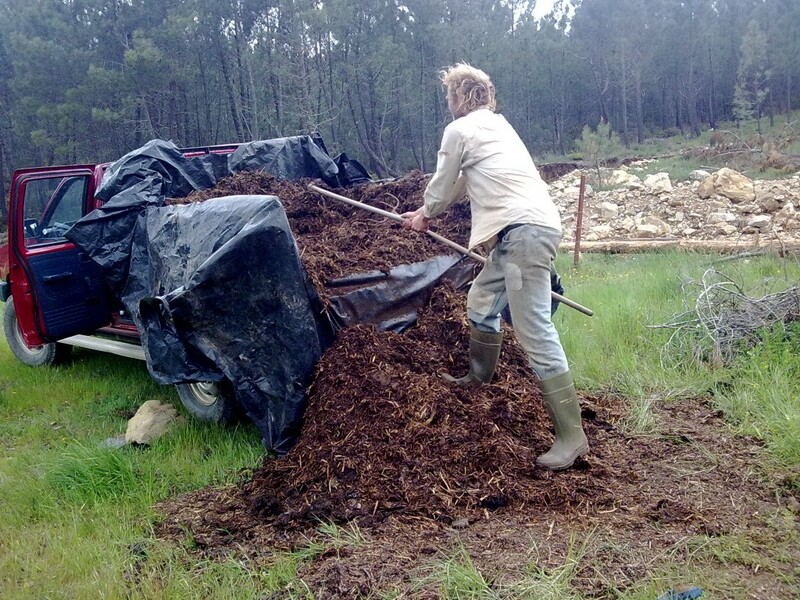 It’s going into the soil whilst we’re preparing it, then we’re using it as a thick mulch between the plants. The earthworms will gradually drag it down, There’s a visible improvement in the soils we’ve been mulching for several seasons. Jeroen and Steve collected another load last night, so I had best go start unloading ….